Duplex Check Scanner w/ MICR – This scanner features a new functionality allowing for remote deposit capture and also helps to manage documents quickly and efficiently. The Duplex Check Scanner w/ MICR brings accuracy and versatility at an affordable price to the Remote Deposit Capture (RDC) arena. With a MICR head to read the magnetic strip on checks and OCR (Optical Character Recognition) technology to verify the information, this scanner increases accuracy of your deposits. 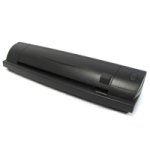 Small, medium and large businesses alike will appreciate that this scanner is intuitive to use and very versatile. Accurate, versatile and simple, the Duplex Check Scanner w/ MICR delivers fantastic value for a unique product.